The Progressive Convention on June 2nd ended with no serious candidate declaring that they will run against Gavin Newsom. Much to the chagrin of many attendees, Ross Mirkarimi adamantly stated that this year is “not my time,” and he will focus on the Board of Supervisors. But Chris Daly never said that he was not running, as he told me right after his speech: “I promised a candidate from this Convention.” Daly added that he can’t take out papers until 9:00 a.m. today, and that he will discuss it with his family over the weekend. But with his wife expecting a baby one week before the Election, is it likely to happen? If Daly doesn’t file today, the Convention paved the way for Matt Gonzalez to run. “My whole idea of emerging as a candidate,” said Gonzalez, “was if no candidate emerged from the Convention.” Gonzalez did not attend Saturday’s Convention and had said that he did not want to be considered at the time. Many activists are upset with Gonzalez for not showing up, but practically everyone I talked to said they would support him anyway. Gonzalez is still non-committal about running, but if he does it will be a serious effort to win. And a winning campaign, said Gonzalez, requires a much bigger tent than the 300-odd people who showed up at the Convention. “I’m not impressed with the Mayor,” said Gonzalez in a phone interview yesterday, “and I feel that he should be beat. But it takes a lot of work to run for Mayor. Newsom has made a lot of inroads in the progressive community, so you can’t just run a candidate and expect to get 70% of the vote in the Mission. A winning campaign would have to meet with voters on the West Side and pick up support over there.” While the Convention brought a lot of energy from activists who cut their teeth in progressive campaigns, the whole structure of it and how it was framed – “Chris Daly’s Convention” – was not a winning formula. Public Defender Jeff Adachi said that progressives “have come into our own,” but steered clear of talking about the Mayor’s race. Instead, he said he was dedicating his life to prison reform and blasted the Schwarzenegger budget. “What we have seen is unprecedented in the corruption and fear from our leadership in Sacramento,” said Adachi. “We have a prison system that has failed repeatedly.” Adachi’s speech was so well received – many chanted “Adachi for Mayor” – that I asked if he would run for Governor. He demurred. There was plenty of criticism of Newsom at the Convention as an ineffective Mayor who governs by press release while the homicide rate climbs, our Muni system breaks down and the City becomes less affordable. “Our Mayor is a conservative Mayor,” said College Board member John Rizzo. “He will make statements, but he won’t take action.” Rizzo’s colleague, Julio Ramos, was even more blunt. “We need a candidate, and we need a candidate today,” said Ramos. But even a losing progressive candidate is better than no candidate at all. If the Left doesn’t produce a mayoral candidate this November, we could have a very conservative electorate dominated by West Side voters. It won’t take many signatures for a well-funded minority to put the McGoldrick recall on the ballot, generating a huge turnout in the Richmond. And in the Sunset, it’s safe to assume that Ed Jew’s days are numbered and we may have a special election to replace him. This dynamic could spell disaster for progressive ballot measures, including a parcel tax to help fund our public schools. In 1999, such a scenario finally pushed Tom Ammiano to run a “write-in” campaign for Mayor. Ammiano did not initially believe he could win the election, but he had various ballot measures such as a ban on ATM fees that were in jeopardy due to the lackluster Mayor’s race. Ammiano lost the election, but his presence on the ballot assured victory for his propositions. Even if Newsom wins at the end of the day, there’s a lot to be said about a progressive candidate running a “protest” campaign this year. 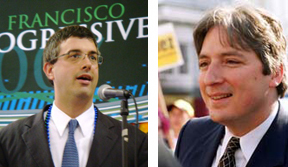 In the case of Gonzalez, he would not be a “protest” candidate because he’s proven to have more of a base than Daly, Ammiano or Mirkarimi. “There’s never been a progressive candidate in the history of San Francisco who got more votes than I did,” said Gonzalez. “I got 30,000 more votes than Ammiano [did in 2003]. You need to look at a universe of people who have demonstrated citywide appeal.” But Gonzalez said that if he had to make a decision today, he would not run – and if he had to make a decision next week, he would not run. “This is a good formula,” said Mirkarimi. “It is not my time to run right now. Who we are is not candidate-dependent only. The trajectory is not just about 2007 – but also 2008. We have to create the movement base that is not attached to a single candidate.” Mirkarimi left the stage despite protests from attendees pleading him to reconsider. Now the attention turned to Chris Daly, who had launched the Convention in the first place, had promised that the Convention would produce a candidate, and who said he would be that candidate if nobody else ran. But unlike Mirkarimi, there were no chants of “Run Chris Run!” in the room. “This is a progressive city,” said Daly, “that is reflected in its people and its representatives.” Daly reminded the crowd of what happened eight years ago, when progressives were hopeless about not having a mayoral candidate until Tom Ammiano entered the race. “There was a popular Mayor with downtown money, and there was no progressive in the race,” said Daly. But the parallels with 1999 are not exact. While Willie Brown was favored to win re-election and there was no progressive candidate, his approval ratings were extremely low – not how voters see Gavin Newsom. And the Board of Supervisors did not have a progressive majority like it does now, so the need to field a mayoral candidate was far more urgent because something had to be done. Daly held up a “We Believe!” sign to commemorate the Golden State Warriors’ recent victory, and worked up the crowd by saying “we believe that government exists to treat everyone with dignity and respect. We believe in the people of San Francisco and I ask you, do you believe on November 6th we can take back the office of Mayor?” Daly then stepped off the lectern without announcing – one way or another – whether he would run. Which brings us back to Matt Gonzalez, who had refused to be considered at the Convention so that other candidates could step up to the plate. If Daly announces today that he met with his family and a mayoral bid is not possible, the ball is back in his court. “The fact that I’m even looking at this race is not something that people should be critical of,” said Gonzalez, in response to complaints from many of his old supporters. Many activists who attended the Convention are upset with Gonzalez, but at this point will it matter? He may be the only hope for progressives who want to see Newsom challenged, the best shot at running a serious campaign, and the more they complain about him, the less likely he will run. And if Gonzalez doesn’t run and progressives don’t have a candidate, what exactly did five hours on a Saturday accomplish?